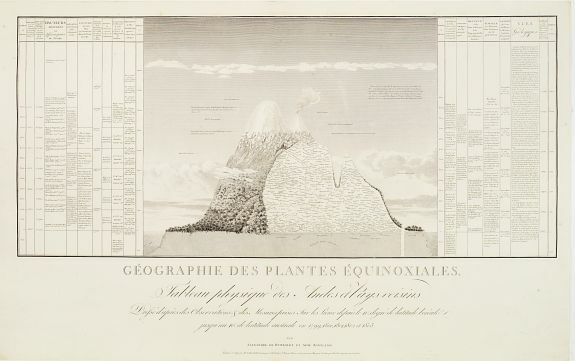 LANGLOIS - Géographie des Plantes Equinoxiales - Tableau physique des Andes et pays voisins.. Size : 14.7 x 32.9 inches. / 37.3 x 83.5 cm. Description :''Physical Portrait of the Andes and adjacent lands'', around the Chimborazo and Cotopaxi volcanoes, in Equador. With local vegetation illustrates pictorially on the left side, names of botanical species given on the right part. At both sides a table giving scientifical informations about physical phenomena and data according to the altitude. Outlined and written by A. von Humboldt, drawn by Schoenberger and Turpin, engraved by Bouquet and Beauble. From the Voyage aux regions equinoxiales du Nouveau Continent''.